A classifier with a linear decision boundary, generated by fitting class conditional densities to the data and using Bayes’ rule. The model fits a Gaussian density to each class, assuming that all classes share the same covariance matrix. The fitted model can also be used to reduce the dimensionality of the input by projecting it to the most discriminative directions. 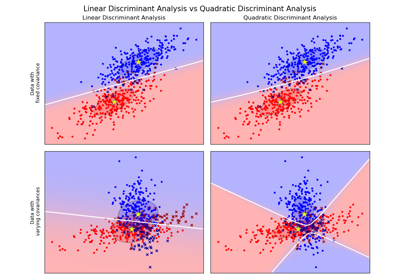 New in version 0.17: LinearDiscriminantAnalysis. ‘svd’: Singular value decomposition (default). 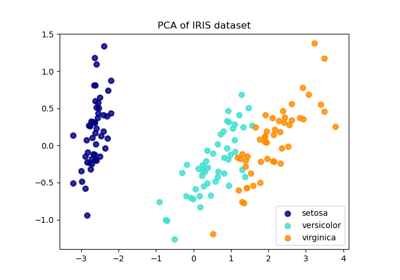 Does not compute the covariance matrix, therefore this solver is recommended for data with a large number of features. ‘lsqr’: Least squares solution, can be combined with shrinkage. ‘eigen’: Eigenvalue decomposition, can be combined with shrinkage. ‘auto’: automatic shrinkage using the Ledoit-Wolf lemma. float between 0 and 1: fixed shrinkage parameter. Note that shrinkage works only with ‘lsqr’ and ‘eigen’ solvers. 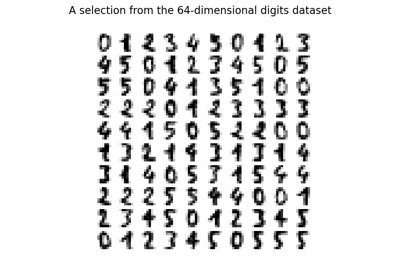 Number of components (<= min(n_classes - 1, n_features)) for dimensionality reduction. If None, will be set to min(n_classes - 1, n_features). Additionally compute class covariance matrix (default False), used only in ‘svd’ solver. Threshold used for rank estimation in SVD solver. Covariance matrix (shared by all classes). Percentage of variance explained by each of the selected components. If n_components is not set then all components are stored and the sum of explained variances is equal to 1.0. Only available when eigen or svd solver is used. Class priors (sum to 1). Scaling of the features in the space spanned by the class centroids. The default solver is ‘svd’. It can perform both classification and transform, and it does not rely on the calculation of the covariance matrix. This can be an advantage in situations where the number of features is large. However, the ‘svd’ solver cannot be used with shrinkage. The ‘lsqr’ solver is an efficient algorithm that only works for classification. It supports shrinkage. The ‘eigen’ solver is based on the optimization of the between class scatter to within class scatter ratio. It can be used for both classification and transform, and it supports shrinkage. However, the ‘eigen’ solver needs to compute the covariance matrix, so it might not be suitable for situations with a high number of features. decision_function(self, X) Predict confidence scores for samples. 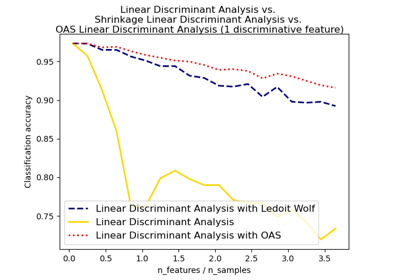 fit(self, X, y) Fit LinearDiscriminantAnalysis model according to the given training data and parameters. predict(self, X) Predict class labels for samples in X.
predict_log_proba(self, X) Estimate log probability. score(self, X, y[, sample_weight]) Returns the mean accuracy on the given test data and labels. transform(self, X) Project data to maximize class separation. Predict confidence scores for samples. The confidence score for a sample is the signed distance of that sample to the hyperplane. Confidence scores per (sample, class) combination. In the binary case, confidence score for self.classes_ where >0 means this class would be predicted. Changed in version 0.19: store_covariance has been moved to main constructor. Changed in version 0.19: tol has been moved to main constructor. Predict class labels for samples in X. Predicted class label per sample. Returns the mean accuracy on the given test data and labels. 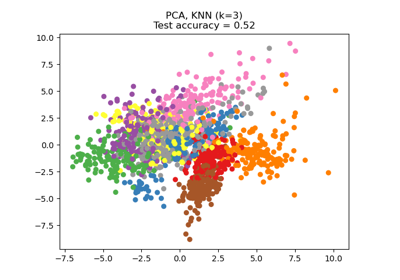 In multi-label classification, this is the subset accuracy which is a harsh metric since you require for each sample that each label set be correctly predicted. Project data to maximize class separation.